“I believe I was the first person in Western New York to own Trivial Pursuit,” said Mike Driscoll, owner of Founding Fathers Pub. If you’ve ever bellied up to his bar on Edward Street in Buffalo, you understand that bold claim isn’t farfetched. Driscoll leads a fairly famous Trivia Night the first Tuesday of every month, but he is also known to serve up a pop quiz to customers just stopping in for a burger. He is a former social studies teacher, after all. The topics can range from geography to animals to food to history with an emphasis on American presidents. Driscoll told me he has over 200 questions committed to memory involving our past commanders-in-chief. “I’m a historian. I don’t get into politics. If you want to talk about current political events, ask me in 20 years,” joked Driscoll. “I try to stay away from trick questions, but even challenging questions become simpler when you’re working with others,” added Driscoll. And remember, if you’re stumped, the answer might be right in front of your eyes. 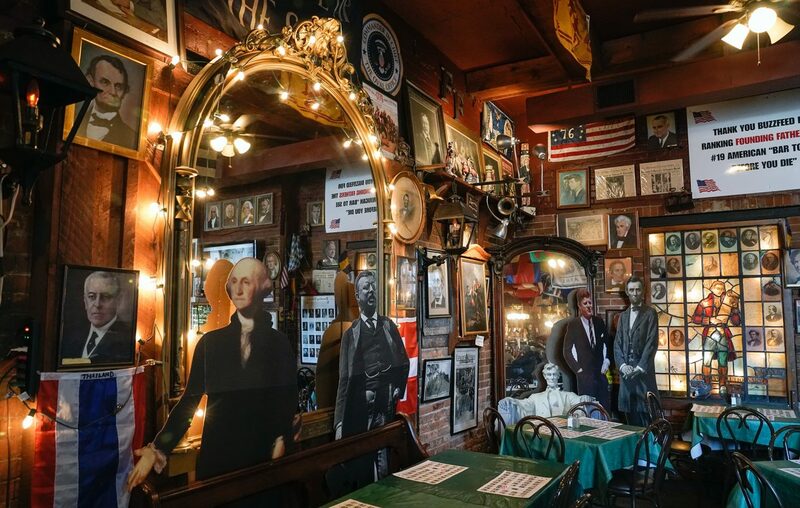 Founding Father’s is completely decked with presidential memorabilia, which Driscoll began collecting while chaperoning field trips to the Smithsonian during his teaching days. It’s worth a visit to take a lap around the place and see it all. “There’s a Kennedy section in the back with John, Jackie and Bobby. Plus, my favorite piece (by the nacho bar) is George Washington crossing the Delaware on one of our Independence Burgers,” noted Driscoll. While I’d be remiss to give away any more trade secrets, you’ll also notice four presidents—Roosevelt, McKinley, Fillmore and Cleveland—in oval picture frames behind the bar. It may pay to brush up on those four gentlemen with Buffalo connections before your next visit.